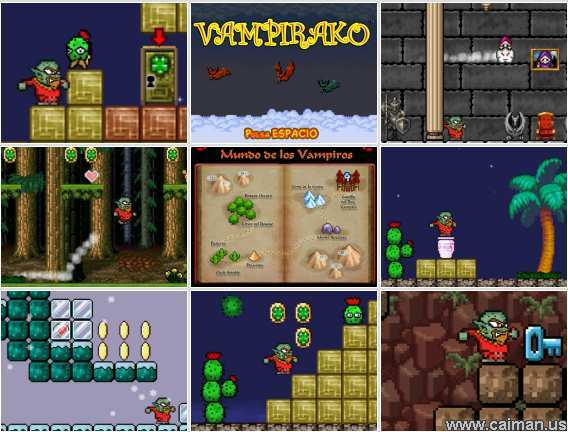 Caiman free games: Vampirako by Omar Serralvo Diago. 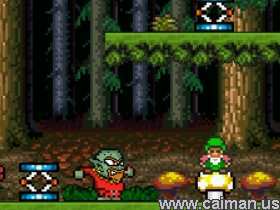 Since Vampirako is in spanish, the several dialog boxes are in spanish. To those who do not read spanish this should not be a problem, but if you do read spanish, this will only enhance your enjoyment of the game. Collect 100 gold plated four leaf clovers to gain an extra life. Get a heart of energy to heal your wounds. Drink of the bloody potion to be immune from the dangers of most enemies for 30 seconds. Some exit doors can only be accessed by flying to them. Down arrow = transforms Vampirako into a vampire bat when standing on a jar. 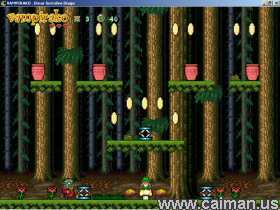 Space = shoots fire balls (able to destroy most enemies and some blocks of stone). Also reverses the transformation of Vampirako. Much more could be said about Vampirako, but that would leave fewer "pleasant surprises" for you to find out about on your own. It weighs in at only 3.2 MB, so there can be no reason not to download it. Get it now.